The Home Screen is the screen that you see immediately upon opening the app. Any plans you have downloaded will show here. Tap on the plan to open it's contents. Tap on an event icon to view that event's information. 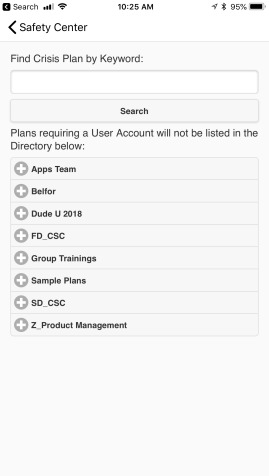 Click on the plus sign icon ( ) to access the plan search and directory screen. *Note: Only publicly listed plans or plans available by keyword search can be accessed from this screen. If a plan has been given one or more keywords, enter those keywords and click Search. Some plans can be found by navigating through the directory. Tap on the directory categories to expand it's contents. When you find the plan you want to access, tap on it and it will begin downloading. When it is finished downloading, it will show on the home screen of the app. 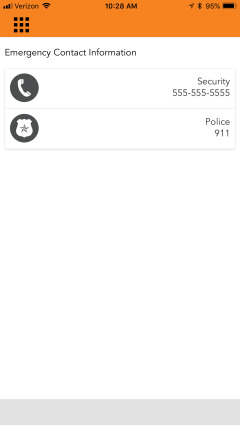 The panic screen feature allows mobile users to quickly access and use a custom shortcut of phone numbers and contacts directly from the home screen. 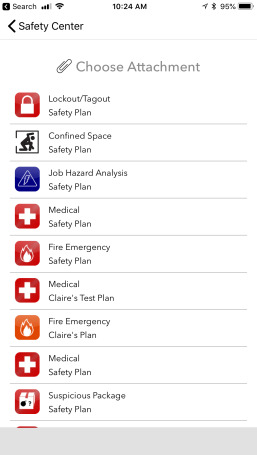 If any of the plans you have downloaded have a panic screen set up, a red icon will show at the bottom of the app ( ). If only one of your downloaded plans has a panic screen, tapping on the icon will take you directly to that panic screen. If multiple downloaded plans have a panic screen, you will first need to choose which plan's panic screen you want to see. 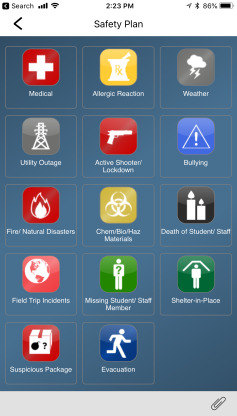 For any form(s) of contact listed on the panic screen, tap that section and your device will perform that action. You may need to confirm the action before continuing. 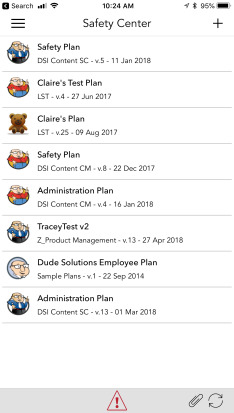 The paperclip icon ( ) shows on the home screen of the app, on the plan screen, as well as within a plan event, indicating that there is an attachment. Tap on the paperclip icon on the home screen to see all events within all plans that have an attachment. Tap on the event containing the attachment you want to view. Tap on the paperclip icon on the plan screen to see all events within that plan that have an attachment. Tap on the event containing the attachment you want to view. Tap on the paperclip icon on an event's screen to view that event's attachment. Tapping on the refresh icon ( ) forces the system to check for updates to any of your downloaded plans. From the home screen of the app, tap on the hamburger icon ( ) to access the app menu. Manage Account: This option is where you can either create an account if you haven't already, or manage your account if it is already created. Set PIN: If you have downloaded a plan that requires you have a PIN, click here to set it up. Push Messages Received: Administrators can choose to send out push messages to users who have downloaded a plan. This option will keep an archive of any push messages you have received. 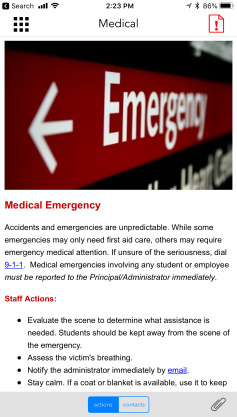 Reports and Forms Sent: When you send a report from the app, it will be archived here. Click here to learn more about submitting a report. Log Off: Click here to log out of your account on the app. Any plans that do not require that level of security will remain on your home screen. Frequently Asked Questions: Check here first if you have any questions about using the app! More Info: If you would like to send an email to our support team to ask a question, click on this option. A new email will open in your mail application which you can edit to include your information, and then send. Feedback: This will function just like the More Info option, but use this if you would like to provide general app feedback. About: Click here to find out which app version you have downloaded to your device. Flashlight: This will turn on the flashlight feature on your device. Tap this option again to turn the flashlight off. Alarm: This will turn on the alarm noise. Tap this option again to turn the alarm off. *Note: The alarm noise will not be audible if your device is on vibrate mode.